Wildfire is the term used for an uncontrolled fire fuelled by natural vegetation. In Australia wildfires are called bush fires and in North America they are called brush fires. They often start in rural, wilderness areas but migrate to rural-urban fringes, affecting buildings, animals and people. 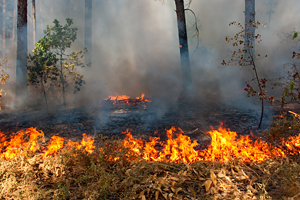 In general, wildfires are caused by a mixture of factors such as high temperatures, drought conditions following a period of vegetation growth and a trigger which can be natural such as lightning or human influenced such as arson. El Nino is thought to have an effect on the occurrence of wildfire cases. Due to El Nino tropical countries on the western pacific experience a higher risk due to the enhanced dry season. In September 1997 Malaysia and Indonesia were affected by major wildfires, there were bush fires in Australia in late 1997 and early 1998 and forest fires in Borneo during April 1998, all of which are thought to be due to the prevailing El Nino. Except for Antarctica no continent is free from the threat of wildfires. Australia is the most fire-prone country in the world with an average of 2,000 wildfires a year. The highest risk zones for wildfire are the Mediterranean or Continental climate. This is due to the majority of rainfall falling in winter so vegetation is very dry in the summer months, creating a greater fire risk. The south of France is a popular holiday destination which has a greater risk of fire due to tourist activities, 5,000 hectares of forest burn annually. The USA experiences dry air much of the year, creating a long fire season. The Wisconsin wildfire (1871) On 8th October 1871 the hot, dry climatic conditions were perfect for wildfire ignition near the town of Peshtigo. As the wildfire raged the superheated air destroyed the town, along with 400,000 hectares of vegetation, and killed 1,500 people. The Indonesian wildfires (1997) In September 1997, the burning of plantations raged out of control causing widespread bush land fires on the islands of Sumatra, Sulawesi, Borneo and Java. More than 3,000 hectares were destroyed. It is believed the El Nino related dry season had an affect on the extent of the fires. The fires caused major air pollution which affected 70 million people and caused the release of 2.6 billion tons of carbon, carbon monoxide and sulphur dioxide into the atmosphere. All of these pollutants are greenhouse gases which would have increased the effect of global warming. Victoria wildfires (1983) In February 1983, large areas of Victoria and South Australia were affected by wildfires. The area experienced classic 'wildfire weather' with temperatures over 40oC combined with winds speeds of 20 ms-1. 26 people died and 8,000 people were made homeless.